The Saffronart team has been scuttling around to put together a handy list of exhibitions to check out this month. Some end soon, and with some others you can take your time, though we wouldn’t really recommend waiting too long. So if you’re in Mumbai, Delhi, England or the U.S. of A. this month, you know where to go. Ghiberti, Lorenzo (1378-1455). Gates of Paradise. You don’t need to travel all the way to Florence to get a glimpse of Italian Renaissance…not this week anyway. 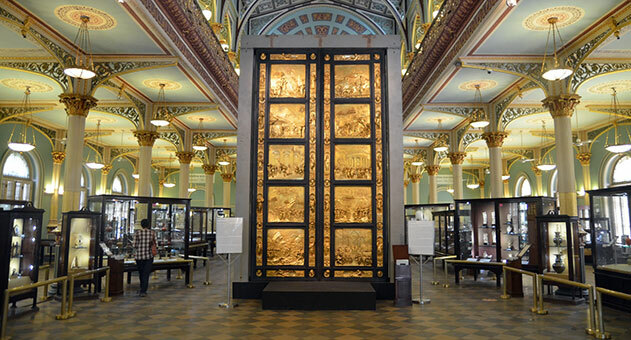 The Bhau Daji Lad Museum has extended this exhibition which features prolific early renaissance artist Lorenzo Ghiberti’s masterpiece, ‘The Gates of Paradise’: a work also revered by other artists such as Michaelangelo himself. The interior and permanent collection at the museum will be an added bonus to your visit. Ever thought about chairs beyond their functional and aesthetic qualities? Mansoor Ali’s ongoing show at the Gallery Maskara is sure to provoke you to think about much more through his installations that employ chairs as a primary medium. His five installations address several issues pertaining to politics and power play, reminding us of the effectiveness of found objects in art. If the idea of visiting this exhibition hasn’t incentivized you enough already to make your way to Colaba, you should know that the nearby Mumbai Art Room, Sakshi Gallery and Galerie Mirchandani + Steinruecke have ongoing exhibitions too. You could combine visiting the three galleries to make for an enjoyable, art-filled afternoon. Don’t miss Sakshi while on your mini art excursion. This exhibition features a mix of paintings, photographs and sculptures by important contemporary artists whose works you should be acquainted with. This is a unique exhibition that is presented in collaboration with the Polish Institute. The exhibits include photomontages, films and sculptures by five contemporary artists who share a common Polish background. While the artists explore the common theme of looking back and questioning the past, they each employ a unique individualistic approach. Not only does this exhibition give you the chance to learn more about Polish contemporary art, but it should also compel you to think about your own associations with the past. If Italo Calvino popped into your mind on reading this, you’re quite close to guessing the theme of this exhibit. “They are stories of spaces that are invisible or underground, mute spaces hidden under the bustling cover of the city. They are stories of people and their relationships, of which the artist is part of”, reads the Vadehra Art Gallery press release. Featuring well-known artists and photographers such as Atul Bhalla, Gauri Gill, Sunil Gupta, Malini Kochupillai and Asim Waqif, this group show highlights aspects of cities that may otherwise remain unnoticed. Perhaps your otherwise hectic urban life doesn’t give you the opportunity to actively observe the little details that are easily missed. Don’t miss this chance to see the work of these acclaimed artists, under a single roof. Pradeep Puthoor, an artist from Kerala who has shown his works in a number of galleries across India and abroad, is featuring his new mural-size paintings in this exhibition. These paintings depict the meeting point between computer science and biological engineering, and create a space for viewers to “swim in and get lost, to drown in their luscious complexities.” The unique theme and large paintings are sure to entice a wide audience, making Nature Morte an ideal gallery to visit this July. Did you think you missed this show? You’d be happy to know that the NGMA has extended this exhibition, giving you the opportunity to visit it this July. This retrospective features five decades of work by renowned architect Raj Rewal. The works on display will make you see architecture as a field of visual art, as structures may otherwise be judged mostly on their functionality. Of course, Rewal’s own achievements, such as his work being featured at the Centre Pompidou in Paris, make visiting this exhibition even more compelling. 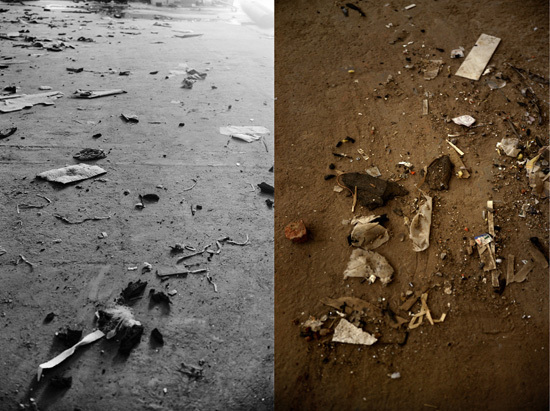 On view and on sale at Gallery Espace are a collection of works by Amit Ambalal, Rajendar Tiku, M.F. Husain, Manjunath Kamath, Owais Husain, Suddhosattwa Basu, Mala Marwah, Mekhala Bahl, Chintan Upadhyay, S.H. Raza, and Jai Zharotia, among others. 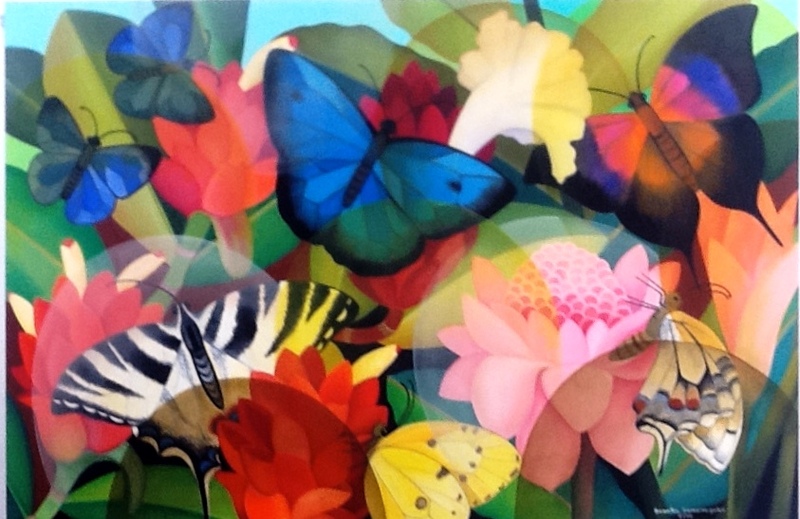 If you’re ever at Green Park this week or the next, pop by Grosvenor Gallery to take in a tropical medley of colours, all harmoniously arranged by one of Sri Lanka’s most important artists, Senaka Senanayake. The prodigal artist has been exhibiting internationally since his teenage years. His recent work is inspired by the plight of the Sri Lankan rainforests, many of which have been subject to intense deforestation to make way for tea plantations. Nasreen Mohamedi is one of the most significant women artists of Modern Indian art, and a critically acclaimed one at that. Tate Liverpool is hosting Mohamedi’s largest solo exhibition in the UK. The show includes more than 50 of her works spanning paintings, drawings and photographs, especially highlighting the most significant artistic phases in her career, and runs in parallel with “Mondrian and his Studios”, exploring how she moved from the figurative to the abstract like Mondrian. Tickets for the latter include admission into the Nasreen Mohamedi exhibition. The UK Punjab Heritage Association has organised an exhibition to remember the invaluable contribution and experiences of Sikh soldiers during the Great War. The exhibition features rare and unique finds such as unpublished photographs and drawings, newspapers and comics, postcards, works of art, uniforms, gallantry medals, and folk songs sung by wives left at home, as well as a unique album of X-Rays of wounded Indian soldiers’ injuries lent by Her Majesty The Queen from the Royal Collection. The London Indian Film Festival is back in town for its 5th edition. Following last year’s success, some of the best Indian independent films will be showing in several venues across London accompanied by talks with cinema personalities such as Santosh Sivan and Farhan Akhtar and a Q&A with film directors. For the full programme, check the London Indian Film Festival website. The Rubin Museum of Art has its eyes on the Indian subcontinent. Head there this month and combine your visits into one eventful day. Given the temporary closure of the Asian art galleries at the Brooklyn Museum, this exhibition allows visitor to partake from this significant museum collection. Curated by the Rubin Museum, the objects trace the development of Hindu and Buddhist sculptures to its root in ancient Indic art. On view are selections of works from various regions including Burma, Cambodia, Indonesia, Thailand, Korea, and Japan, which together map the wide-spread evolution of Asian art in the regions. This is one of the first major exhibitions which chronicle the origin, history and practice of the Tibetan science of healing. It brings to the viewers a visual narrative on the subject by presenting 140 objects dating from the 9th century to the present which includes manuscripts and paintings on medical practices and medical instruments. The exhibition highlights the relationship shared between Tibetan medicine and Buddhism and how it has shaped the visual arts in the Himalayan region. In addition to the historic objects is a multi-media installation which explains how Tibetan medicine is used today and allows visitor to find out personalized health information through questionnaires, making the visit informative and interactive. There’s also a quiz online. Curated by Karl Debreczeny and Elena Pakhoutova, this exhibition gives its audience an introduction to the principal concepts of Himalayan art and its cultural contexts. Visitors are welcomed by a large multimedia map of the Himalayan region which highlights the diversity in the region. This exhibition is divided into four sections: Figures and Symbols, Materials and Techniques, Purpose and Function, and Tibetan Art in Context. 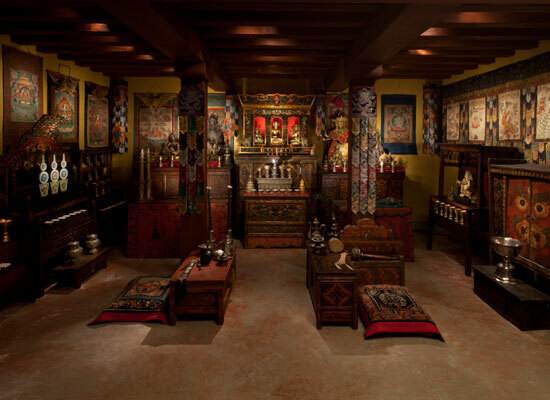 The centerpiece of this exhibit is the Tibetan Buddhist Shrine Room- a recreated model for everyone to experience. This well-documented exhibition has many learning tools making it an interesting visit for a diverse audience. Mithu Sen’s first solo museum exhibition in the US is a massive installation in dental polymer, tracing a pink toothy line across a long prism-shaped room. This is the first of Mithu’s teeth works installed on suspended armature. The 80 feet long hanging sculpture inhabits the gallery space, its sheer scale and texture eliciting strong reactions from viewers. This monumental yet minimalist work reaffirms the artist’s exploration of the connotations of bodily materials like hair, teeth and bone in her works. Where: National Museum of Natural History, Smithsonian Asian Pacific American Center, Washington D.C. This iconic exhibition chronicles more than 200 years of Indian American contributions to the U.S. The 5,000-square-foot exhibition features Indian Americans’ migration experiences, working lives, political struggles and cultural and religious contributions. Highlighted artifacts include a dress worn by First Lady Michelle Obama designed by Indian American Naeem Khan; the 1985 National Spelling Bee trophy awarded to the first Indian American winner, Balu Natarajan; and Mohini Bhardwaj’s 2004 Olympic Silver Medal for gymnastics. Public programs include performances featuring Indian American art, comedy, cuisine, dance, film, television, literature and music. The exhibition will be travelling around the US for four years beginning May 2015. There’s plenty more out there, so don’t forget to drop by our events listing page, updated each month.